Free Thought — UTech, Ja. Free thought was created by a revered Cuban artist, Professor Manuel Mendive. The work is informed by the Yoruba religion as well as Catholicism. His art often involves an intertwining of flora, fauna and people. The sculpture features birds (Messengers from and to God), coming out of the heads of the people. It depicts people opening their minds and letting their thoughts fly. The additional chair is to allow the viewer to participate in the sculpture. The sculpture’s donation to the university was facilitated by Professor James Early of the Folk Museum at the Smithsonian. 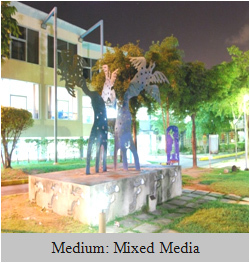 Early explained that when he was first invited to the Caribbean Sculpture Park in 2001 he realized that Mendive’s work would be suited to the space.